Make sure you really need to pay more for the Elantra's upscale Limited model. The base GLS' standard features list is pretty extraordinary, especially at the price. If it's possible, a single car shows exactly how far Korean automakers have come, and how much trouble they're causing for Japanese car companies. That car is the Hyundai Elantra, one of the best compact sedans available today, and one of the strongest new-car values in recent memory. 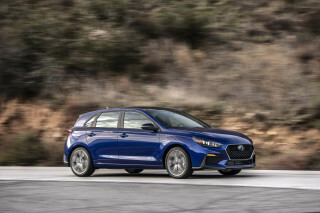 The Elantra, along with the latest Ford Focus and the new Chevy Cruze, has upset the order that held true for most of the past 25 years. The default recommendations of Civic and Corolla no longer hold true, and while the Elantra performs a bit better than in its last generation, it's much improved in gas mileage, much more spacious, and much more refined. It's also a calling card for the Hyundai brand in terms of styling. The Elantra may have the best iteration of Hyundai's "fluidic sculpture" styling theme. It's an even smoother take than on the bigger Sonata sedan, and catapults the Elantra out of its old staid look, into a sporty, modern space. From some angles, the Elantra looks like it's about to leap ahead; the rear door cuts in particular seem to keep the body in constant visual motion. The interior could be even a little more successful, as it tames some of the swoopy lines that could look overdone in the Sonata. In particular, the hourglass shape of the center console is fresh and distinctive, a purely Hyundai design cue from a brand that's had few visuals all to itself in the past. It's a look that brims with confidence. With its redesign last year, Hyundai downsized the Elantra's 2.0-liter four-cylinder engine to 1.8 liters, but power remains more than acceptable. With 148 horsepower and 131 pound-feet of torque, the Elantra performs respectably with either a six-speed automatic or a six-speed manual, thanks in part to a lightweight body of less than 2,700 pounds, or more than 60 pounds lighter than the car it replaced. 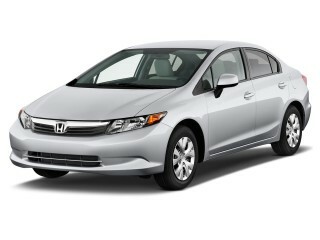 Acceleration is smooth, though the four-cylinder gets boomy at the upper reaches of its rev range. The Elantra doesn't feel as energetic or engaging as the Ford Focus, though, because its throttle is slow to respond to inputs, and its steering--while improved with better on-center feel this year--isn't especially natural in its feedback. Ride quality is excellent, though, and the Elantra soaks up road noise as well as, or better than its competitors, with noise levels about as low as some mid-size sedans. That's an important metric for the Elantra, since its interior space borders on mid-size as well. The front seats could use a little more bolstering and lateral support, but they're surrounded by ample space in all directions. In back, the leg room is fine for adults, but head room can be tight, even for medium-height passengers. The rear seats fold forward easily, if not completely flat, and that allows longer objects to be loaded into the relatively large, wide trunk. The Elantra's interior has lots of useful cubbies and storage bins, including a covered one that sits ahead of the shift lever: it also contains the aux jack, a power point, and the USB port in an easy to reach module, perfect for connecting smartphones. All Elantras come with those features, and others that make it one of the best-equipped base vehicles in the segment. Even the base GLS has power windows, locks, and mirrors; keyless entry; and (on automatic models) air conditioning; cruise control; and telescopic steering. Options can turn the Elantra into a luxurious sedan; the navigation system has one of the largest LCD touchscreens in the class, and it's beautiful to look at and to use, with voice recognition for phone, audio, and and destinations, plus real-time traffic and weather. Bluetooth and audio streaming are standard, too; a rearview camera comes with the navigation system, and to top it all off, the Elantra earns the IIHS' Top Safety Pick designation. The 2012 Hyundai Elantra looks and feels responsible, yet it grabs our attention and won't let go—all good things in a field of small-car sameness. The Elantra may have the best iteration of Hyundai's "fluidic sculpture" styling theme. The Elantra is an even smoother take on the larger Sonata sedan, and from the back you might actually mistake it for its mid-size sibling. Hyundai intended to take the Elantra in a "sporty and modern" design direction this time, and we think it succeeded—this new compact sedan looks, from some side angles, like it's about to leap forward. The interior could be even a little more successful, as it tames some of the swoopy lines that could look overdone (and perhaps soon dated) in the Sonata. The cabin look combines some of that curvaceousness with some interesting new cues—specifically, the pinch point where the center console meets the rest of the dash. That hourglass shape is fresh and distinctive, a purely Hyundai design cue from a brand that's had few visuals all to itself in the past. And it's a look that brims with confidence. 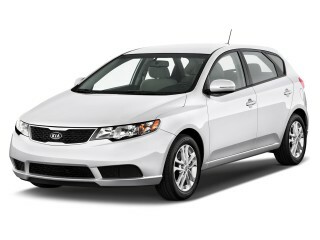 Confident performance is something you'll find in the 2012 Hyundai Elantra, but a sporty or athletic driving feel isn't. Last year, with the Hyundai Elantra's redesign, the automaker downsized the engine from 2.0 liters to 1.8 liters, but power remains more than acceptable. While keeping performance on par or better than the former engine, Hyundai was able to reach a 38-mpg fuel economy figure. With 148 horsepower and 131 pound-feet of torque, the Elantra performs respectably with either a six-speed automatic or a six-speed manual, thanks in part to a lightweight body of less than 2,700 pounds, or more than 60 pounds lighter than the car it replaced. The new, all-aluminum 'Nu' engine is a major advance in itself. With a host of improvements and/or weight-saving measures like a composite intake, silent timing chain, and electronic throttle (but not direct injection), it's now the only engine offered on the Elantra in the U.S. Its idle quality is glassy-smooth, and it never reaches that coarse, buzzy range that makes so many small fours unbearable in their peak powerband. And it's right at home in the 2,500 to 4,500 range—where it'll be pretty much whenever you're increasing speed with the six-speed automatic transmission, which will be far more popular than the perfectly fine six-speed manual. The Elantra doesn't feel as energetic or engaging as the Ford Focus, though, because its throttle is slow to respond to inputs, and its steering--while improved with better on-center feel this year--isn't especially natural in its feedback. On the other hand, ride quality is great, and the Elantra comes with standard four-wheel disc brakes and a firm pedal feel--better than the cost-cut rear-drum setup that's now so common in this class. The cabin of the 2012 Hyundai Elantra stands out from the pack thanks to its smooth, quiet ride and impressive interior materials. The interior of the 2012 Hyundai Elantra is almost mid-sized by the numbers—though tight headroom in the back seat gives it away as a compact. Inside, the Elantra is generously sized, though its front seats in particular could be better for long-distance comfort. In front, there's enough headroom and legroom (even with the sunroof), but the seats could use more bolstering and support, as well as longer lower cushions. The front seats of some models have slightly elevated sides, as if there's some support, but it's just a tease. In back, the leg room is fine for adults, but head room can be tight, even for medium-height passengers. To be fair, it's about par for this class, with only the Jetta providing more headroom. While rear-seat heaters are on the options list—kudos for being first ever in this class—there are no true backseat heater vents (also like most vehicles in this class). The rear seats fold forward easily, if not completely flat, and that allows longer objects to be loaded into the relatively large, wide trunk. We like how the two easy-release pulls are within easy reach; the seats don't quite fold flat, but there's enough of an opening for fitting gear or tools for a trip across town. The leather that's available is perforated in a wave pattern and won't be mistaken for luxury hide, but it feels supple enough. Throughout the interior, you'll find plastics that are about par for the class--a mix of hard, scuff-resistant and soft-touch surfaces--and there are lots of useful cubbies and storage bins, including a covered one that sits ahead of the shift lever: it also contains the aux jack, a power point, and the USB port in an easy to reach module, perfect for connecting smartphones.. The 2012 Elantra soaks up road noise better than most small cars (in part because of its soft suspension calibration), and at 70 mph it's not much different than in a four-cylinder mid-size sedan. The 2012 Hyundai Elantra looks like a good choice for the safety-conscious small-car shopper, although its occupant-protection ratings aren't perfect. The 2012 Hyundai Elantra was an all-new model last year, and it's now been put through the full range of crash tests from the Insurance Institute for Highway Safety (IIHS) and the National Highway Traffic Safety Administration (NHTSA). The verdict? Either excellent, or good with some reservations, depending on which you place greater weight. Our advice is that you should pay attention to both tests and consider the Elantra one of the safer picks in its class, but perhaps not the best. In IIHS testing, the Elantra lands the Top Safety Pick accolade, including top 'good' ratings in all categories of testing--including the new roof-strength test. But in the federal tests, the Elantra only managed three stars in frontal impact despite top five-star results in both side impact and the rigorous side-pole test. Among budget-priced compact cars, not all safety equipment is always standard (stability control, for instance is sometimes optional in this class). 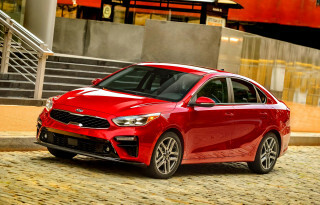 But it's all here and standard across the model line: stability control; anti-lock brakes with Brake Assist; a new Steering Effort Assist system that helps steer you back toward stability and control in a skid; front seat-mounted side airbags; and front and rear side-curtain bags. A rearview camera system is also available, although outward visibility is quite good. 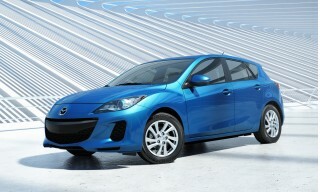 The 2012 Hyundai Elantra offers the very well-equipped car that most shoppers want, without breaking the bank. All Elantras come with a feature set that makes it one of the best-equipped base vehicles in the segment. Even the base GLS has power windows, locks, and mirrors; keyless entry; and (on automatic models) air conditioning; cruise control; and telescopic steering. 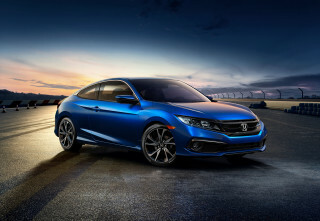 The Limited model adds a sunroof, leather seats and trim, heated front and rear seats, fog lamps, mirror-mounted turn signals, and 17-inch alloy wheels with Continental tires. Top options on the Elantra Limited, all part of a Premium Package, bring the nav system, premium audio, and proximity key entry and push-button start. Even on the GLS, you can get a Navigation Package. Options can turn the Elantra into a luxurious sedan; the navigation system has one of the largest LCD touchscreens in the class, and it's beautiful to look at and to use, with voice recognition for phone, audio, and and destinations, plus real-time traffic and weather. 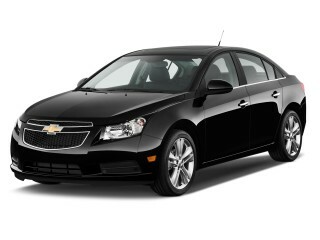 Bluetooth and audio streaming are standard, too, and a rearview camera comes with the navigation system. Hyundai boasts that the nav system has the largest screen size in this class. For the price, its beautiful. And it really is a great system, incorporating voice recognition for phone, audio, and nav control, plus XM NavTraffic, NavWeather, Sports and Stocks integration, Bluetooth audio streaming, 16GB of onboard flash memory, Satellite Radio capability, and the capability to play JPEG or BMP slideshows from thumb drives. To help make the whole ordeal of supply and demand a little easier for all involved, the new Elantra is being offered in just seven build combinations. The down side of this strategy is that there are still holes; you can't, for instance, get the navigation system if you want a manual transmission. Also, oddly, Hyundai makes the telescopic adjustment optional on manual-transmission cars, however, as as part of a Popular Equipment Package. The 2012 Hyundai Elantra in all forms comes with a 38-mpg highway rating. If fuel economy matters, and you're considering the 2012 Hyundai Elantra, there's no reason to go hunting around the dealership for the one vehicle that has a special package. 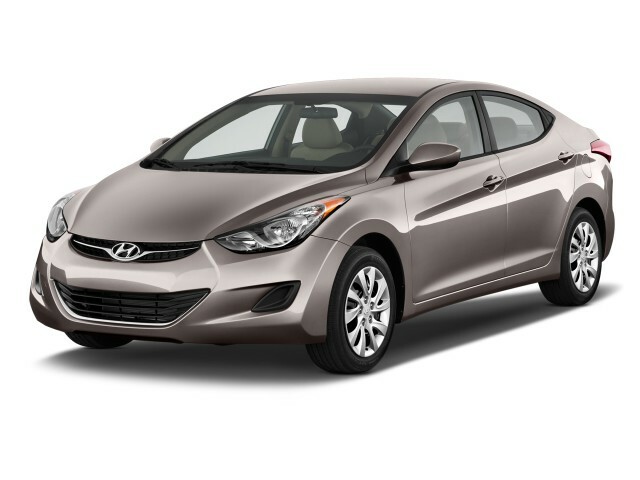 All 2012 Elantras come with official EPA fuel economy ratings of 28 mpg city, 38 mpg highway. Considering that most of a vehicles lifetime carbon footprint is related to fuel use—and Hyundai is including things like aerodynamic tweaks and tall gearing on all cars, it makes the Elantra a very green model line. There has been controversy and complaint over the Elantra's fuel-economy ratings. Many owners are finding they're unable to meet the 40-mpg highway numbers. In ordinary driving, we've noticed numbers that are in the same range as those of other vehicles in this class--about 34 mpg combined in an extended drive, exceeding the EPA Combined rating by 1 mpg. And we've seen close to the EPA highway rating in a real-world Interstate cruise. great car for the price!